Arlington Police released new surveillance video Sunday of a man suspected of sexually assaulting a woman while posing as a building maintenance worker. The assault took place on May 7 at The Atrium apartment complex on Key Boulevard. The man knocked on multiple doors in the apartment building claiming to be a maintenance worker. When the victim opened her door, the man entered her apartment and sexually assaulted her before running from the scene, police reports said. But the man reportedly returned to the building shortly after the attack for unknown reasons. 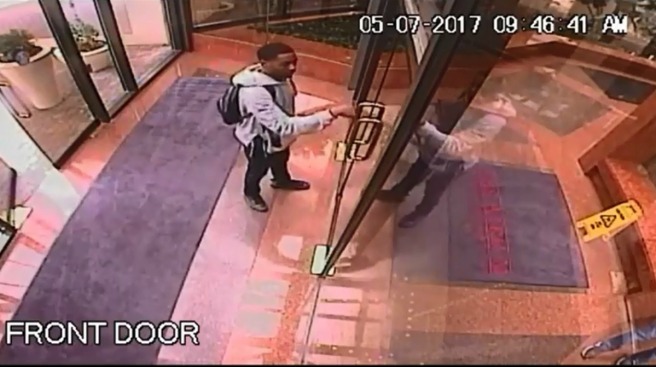 The newly released surveillance video shows him reentering the building through the front doors. Police have already released videos that show the man in a building elevator, walking outside near the complex and jumping a wall a few blocks from where the assault took place. The man reportedly attempted to gain entry at another nearby apartment building before the attack but was denied access by a concierge. Police have not yet identified the man, who is described as a black male in his early 20s with a slim build.